At Continental Stone, our stone products are designed to last for years. With some proper care and attention, you can ensure that you get the very most from your new products. Our knowledgeable staff are on hand to offer advice on your own particular item. Granite is one of the most popular materials for countertops. 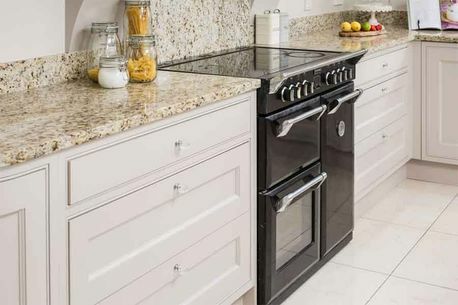 Stylish and functional, granite can offer many advantages over other types of stone. Some of these advantages include resistance to heat, scratch resistant and much more. A granite worktop can offer a durable and luxurious feel to any kitchen or working area. Be sure to call into our showroom in Offaly to see examples of our work up close. What colour worktop should I choose? Most people tend to opt for a light or black worktop in their kitchen. Quartz can also work really well in more modern kitchens. Generally bathrooms can take advantage of the patterns and style offered by a marble stone. We generally steer clear of marble for kitchen countertops, due to the fact that it is not as durable and resistant. Kitchens can typically benefit from a more limited colour pallet. Feel free to bring in swatches/photographs of your kitchen so that our team can help you find the perfect match. Speak to a member of our team today about your new countertop. Never use an abrasive cleaner on your worktops. Stay clear of brillo pads, scouring agents, etc. Bleach and chlorine cleaners can also damage your countertops. Washing down with warm soapy water and drying with a clean cloth is the best and most effective way to ensure that your countertops last as long as possible. Keep your stone worktops clean and free from any build up or residue. We recommend a surface treatment periodically in order to seal and protect your countertops. Our team here at [company_name] can walk you through the type of aftercare required for your particular type of worktop. Try not to strike your worktop with any blunt or heavy objects. These can chip or even crack stone. The edges are the most at risk, so always give appropriate care. Don’t chop or use knives directly on your worktop, always protect your surfaces with a chopping board. While many types of stone are heat resistant; it is always best to protect your counters with a tripod or special mat. If you have any particular questions in relation to the aftercare of your countertop, please speak with a member of our experienced team today. Granite is one of the most desirable materials in the construction industry. Granite is durable and very easy to maintain. There are a few steps you can follow in order to ensure that you get the most from your new worktop. Clean down your granite worktop with warm soapy water or antibacterial agent. Always use a soft non-abrasive cloth. Rinse down your surfaces with clean water to avoid a build-up of detergent. Should you spill a hazardous material on your granite, blot with a paper towel. This will soak up the spill as opposed to spreading it around. Wash the residue with warm water to ensure that it has all been removed. Dry the area with a soft cloth. Ensuring that your granite countertops are well sealed is the best way to help prevent spills from soaking in. If you find that your granite countertops have been neglected, the best thing to use is a heavy duty stone and degreaser. This can remove layers of grease and grime, helping to restore your worktops to their former glory. As always, our dedicated team are on hand to offer professional advice on your own particular worktop. Simply call or drop into our showroom today.